See a 1965 ad for a Pursettes school educational kit - Pursettes Getting to Know Yourself booklet for girls - other teaching booklets: Growing Up and Liking It and How Shall I Tell My Daughter? You see here one of the main points about menstruation in America: it must be kept secret (the word is actually used here and in other Pursettes ads). Therefore a woman should not use pads (this was a time of thick pads); she should use tiny Pursettes, and she has no applicator to give her away, either. See this and related points in the other Pursettes ads listed above, especially the concern about boys' knowing that a girl is menstruating. Horrors! This is an attitude that feeds on itself, with secrecy forcing the need for more secrecy. Crazy. 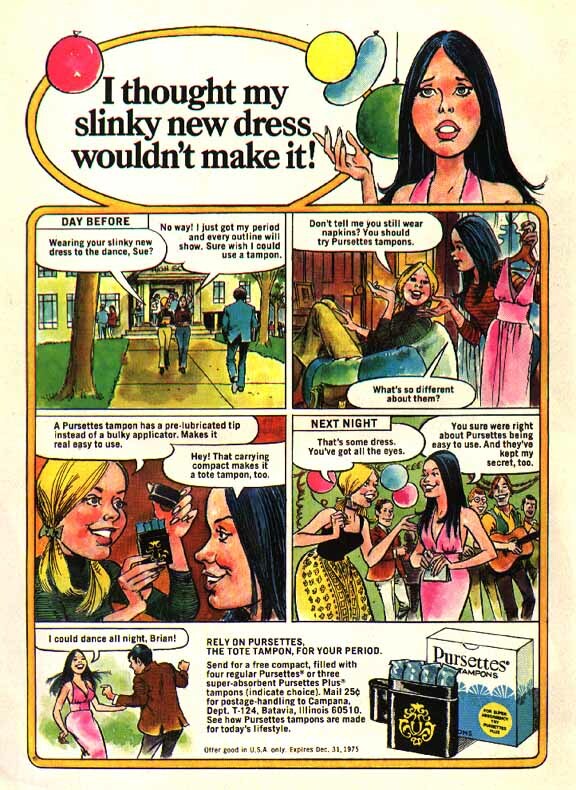 The ad is from 1975, but there is no month or magazine indicated. Large file, long download time!